As far as engineering is concerned, mathematics evolves as an important subject. 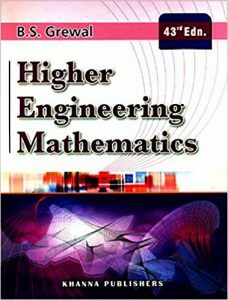 One of the best mathematics books is higher engineering mathematics by BS Grewal. In this article we would provide reasons why it is a top book. Articles highlights deals to buy second hand engineering maths or rent the book, which should save a lot of money. It has been rated as 4.04/5 by good reads whereas amazon has given it 4 stars out of 5. According to the reviews found on good reads and amazon, the book is found to have contained a number of quality problems that are very efficient and help in understanding the subject in depth. However, it is not too explanatory as far as theory is concerned, but it explains mathematics in a way one can comprehend. The book is essentially great in the way it provides numerous examples for the understanding of the reader and covers most of the topics of mathematics that are concerned with GATE examination. It meets complete requirements of engineering and computer science students. The problems and examples provided in the book have been selected from recent papers of various universities and other engineering examinations. The link provides with the various deals available online so as to purchase the hard copy of the book. We would like to hear from you, so do post your comments below! This entry was posted in Online Books Rental, Second Hand Books For Used Books, TOP ENGINEERING BOOKS, RENTAL MARKETPLACE and tagged second-hand books, used books, buy second hand books from Pustakkosh, rent engineering books, used mathematics books, second hand grewal, second hand engineering math by pustakkosh. Bookmark the permalink.